New Mexico State Highway 4 begins in the southwest at San Ysidro, and winds for 68 miles northeast to its intersection with NM 502 near Los Alamos. The route passes through Jemez Pueblo and Jemez Springs as it climbs steeply into the Jemez Mountains and Santa Fe National Forest, and skirts the southern boundary of Valles Caldera National Preserve. 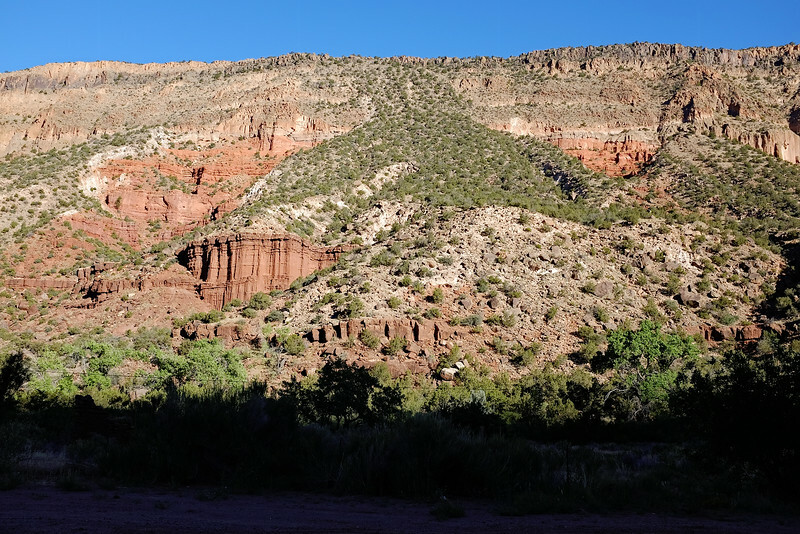 On the east side of the Jemez Mountains it descends steeply on a series of hairpin turns, offering spectacular views into Frijoles Canyon in Bandelier National Monument. Near its beginning, the road traverses a deep canyon, with incredible red rock walls and formations. It then enters the National Forest, with many huge Ponderosa pine, Douglas fir, and Colorado blue spruce dominating the landscape. There are a number of excellent hikes in this area, including one along the East Fork of the Jemez River, and another down to Jemez Falls. Further along, Valles Caldera National Preserve protects a 13-mile wide circular depression formed from a tremendous volcanic explosion about 1.25 million years ago. The preserve is known for its immense mountain meadows, abundant wildlife including a large herd of elk, and meandering streams. The road then continues through Bandelier National Monument, with expansive views to the south and east, and more incredible rock formations where it joins NM 502. I traveled the entire length of this road, including a hike along the East Fork of the Jemez River from the Las Conchas trailhead. There are many magnificent rock formation, very tall trees, and open meadows along the meandering stream. A huge wildfire torched this area in 2011, and there are still many dead trees standing amidst the emerging vegetation.